Hot like Tim's Jalapeno Chips — Paolo M. Mottola Jr. I'm going to get local-TV-news cliche and talk weather. Because it is hot. It is really f'ing hot. 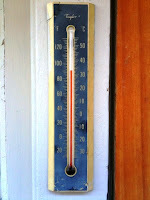 That picture you see to the left is of the thermometer at my house on Monday. That's been the average temperature this week, around 90 degrees. Now I've been in hot weather, people. You might recall the 119-degree heat I endured in Palm Springs before. I could tolerate that because I was in the right frame of mind. Here in the Northwest, we don't have hot weather, so I'm not mentally prepared for it. So I suffer. When it's hot like this I get into a terrible habit of drinking water, beer, whatever to try and cool down. I don't actually cool down so I keep drinking until I'm full of liquid. Like a dog chasing its tail, I can't stop drinking and don't want to. You know that feeling where you jump and can feel the liquid move in your belly? That's been my existence for the past few days. It's hot like Tim's Jalapeno Chips. And I need more water.